There are different types of tests that can be performed with a spirometer. The most important ones are the Forced Vital Capacity and the reversibility test. The forced vital capacity is by far the most widely used spirometry test. To perform this test, the patient first needs to inspire fully in the spirometer (not necessarily as forcefully as possible) and then forcefully blow out all the air in his lungs as quickly as possible. After the complete expiration he needs to inspire a second time, fully and with as much force as possible. For an optimal result, the patient will need to perform this maneuvre at least 3 times to have reproducible results. Most spirometers will calculate reproducibility automatically. The results are expressed as a flow-volume loop, a volume-time graph and more than 20 parameters. The flow-volume loop is the most important graph of the test. The morfology offers a lot of information about the function of the lungs and airways. Although less important, the volume-time graph shows one of the most important parameters in spirometry: FEV1. The volume-time graph also shows the newer parameters FEV0.5, FEV3 and FEV6. The volume that was expired in the first second. The total volume the patient expired during the test. 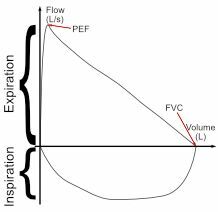 Average expiratory flow between 25% and 75% of the expired volume (FVC). A reversibility test is performed when the results of an FVC test show signs of obstructive lung disease (Tiffeneau<70%). The patient inhales a fast acting bronchodilator like ventolin and performs another FVC test 15 minutes later. The result of FEV1 is compared to the result of the pre-medication test. If the FEV1 post-bronchofilator is more than 12% higher compared to the pre-bronchodilator test, the patient is likely to suffer from asthma. The other spirometry tests are rarely performed outside a hospital setting. the (Slow) Vital Capacity is performed the same way as the FVC but slowly. The Maximum Voluntary Ventilation is very rarely performed nowadays. Provocation testing with a bronchoconstrictor, like histamine or metacholine, is performed to induce an asthma attack and should only be done under the strictest supervision and with emergency care available.